The Audi R8 is a Le Mans Prototype sports-prototype race car introduced in 2000 for sports car racing as a redevelopment of their Audi R8R (open top LMP) and Audi R8C (closed top LMGTP) used in 1999. It is one of the most successful racing sports cars ever (alongside such greats as thePorsche 956/962) having won the 24 Hours of Le Mans race in 2000, 2001, 2002, 2004, and 2005 (five of the seven years it competed). Its streak of Le Mans victories between 2000 and 2005 was broken only in 2003 by the Audi-powered Bentley Speed 8, which used the same V8 twin-turbo engines. Yet, during the fall of 1998, after the necessity of GT1 homologation was dropped in favour of LM-GTP prototypes, regarding the speed and success of these closed GT coupés like the Porsche 911 GT1, Mercedes-Benz CLK-GTR, and the Toyota GT-One, Audi also ordered their newly acquired Norfolk based RTN (Racing Technology Norfolk, led by Tony Southgate) to build a closed-cockpit car using the same drivetrain. Main articles: R8R and R8C. Following a period of testing, two R8Rs debut at the 1999 12 Hours of Sebring. The BMW V12 LMR won, which was a strong sign towards the race in France. The already tested open-top Audi R8R, entered by Joest Racing was not fast enough to challenge for a win, finishing 3rd. Based on the experiences, Audi decided to regroup for 2000, and built a new R8 spyder together with Joest and Dallara. The British-built R8C coupe was retired, but Audi-owned Bentley developed the concept of the R8C closed cockpit LMGTP and entered the Bentley EXP Speed 8 in 2001, winning the race with the Bentley Speed 8 in the 2003. This R8, in a special crocodile livery, won the Race of a Thousand Years in Adelaide, Australia, in 2000. In 2002, the Audi R8 was the first car to beat the Toyota TS020 GT ONE's qualifying lap record from 1999. The R8 won a hat trick at Le Mans in 2000-2002, campaigned by Audi Sport Infineon Team Joest and driven by Tom Kristensen,Emanuele Pirro and Frank Biela. 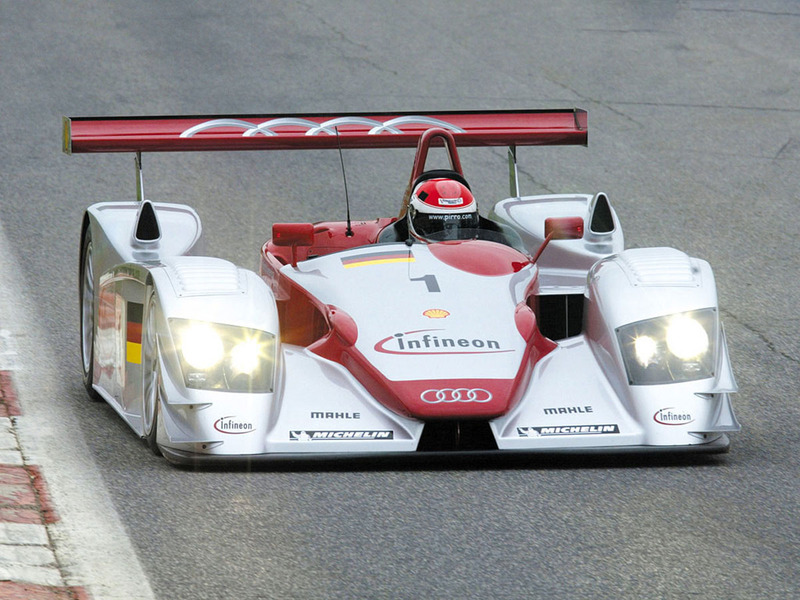 First time out in 2000, the team won a 1-2-3 finish, which was just a small preview of what this all-new Audi was capable of. Since then, the Audi R8 has won numerous championships and races, including further wins for 'privateer' teams at Le Mans in 2004 and 2005. The power supplied by the R8, officially listed at about 610 hp (455 kW) in 2000, 2001 and 2002, 550 hp (410.1 kW) in 2003 and 2004 and 520 hp (388 kW) in 2005, is sent to the rear wheels via a Ricardo five-speed sequential transmission with an electro–pneumatic gear change. That means it has a computer-controlled clutch that allows the driver to make gear changes without touching the clutch pedal. These gear changes can be done by the computer far quicker than even the fastest human being with a conventional manual transmission. 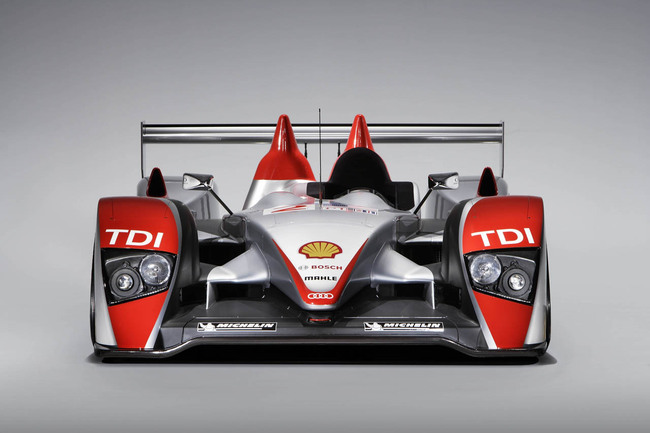 Unofficially, the works-team Audi R8 for Le Mans (2000, 2001 and 2002) is said to have had around 670 hp (500 kW) instead of the quoted 610 hp (455 kW). The numbers were quoted at speed, and were due to the car making 50 extra horsepower due to twin ram-air intakes at speeds over 150 mph (240 km/h). Official torque numbers were quoted for this version of the engine at 516 lb·ft (700 N·m) at 6500 rpm. The equation for horsepower (torque divided by 5250, multiplied by rpm) for these numbers produces a horsepower rating of 638 horsepower (476 kW) at the same 6500 rpm (516/5250*6500=638). Peak rpm for horsepower was 7200, so it can be safely said that the engine made much more than 610 hp (450 kW) in those years. The Audi R8's structure was designed from the very beginning to expedite parts changes during the race. The car has a chassis that has been likened to a Lego model — anything on the car can be changed and changed quickly. During its campaign, the Joest pit crew was able to change the entire rear transaxle of a damaged R8 — a process which usually takes between one and three hours — in as low as three minutes and 16 seconds. The reason for this was that the transmission, rear suspension and rear subframe were built as one unit. The car had numerous quick-connect hoses and easily removable bolts. The whole rear section of the car could be removed as a whole and a new back half installed with the help of a crane. The Automobile Club de l'Ouest (ACO), organizers of the 24 Hours of Le Mans and the American Le Mans Series acted quickly to void this advantage by mandating the gearbox casing be the same item through the duration of the race, with only the internals being allowed to be changed. However, the R8 still had quicker access to the gearbox internals than any other car due to its quick-change construction . This was critical as the gearbox was the weak link in the car. The R8's structure and body are both composed of carbon fibre, a strong, lightweight polymer material that is both expensive and time-consuming to mold. The Bentley Speed 8, which ran at Le Mans from 2001 to 2003, winning in 2003, utilised a heavily modified 4.0 L version of the V8 engine from the Audi R8. The Bentley racing effort was campaigned by Team Bentley (Apex Motorsport) with assistance from longtime R8 competitor Joest Racing and Audi Sport UK. 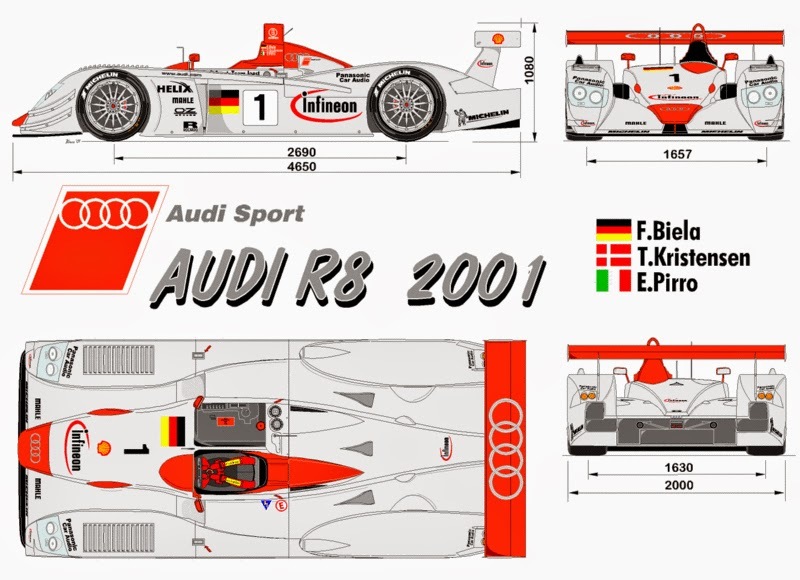 After 2002 the Joest factory team dropped its R8 campaign and left it to the privateers. Restrictor changes brought the power down to 550 bhp for anyone still racing with the R8. However the maximum torque hardly changed. Tom Kristensen, who won the previous three 24 Hours of Le Mans races in an R8, was assigned to drive the Bentley Speed 8, and helped guide the team to victory. (Kristensen went on to win the 2004 and 2005 races in an Audi R8). There is some similarity between the Bentley Speed 8 and the Audi R8's successor, the R10 TDI. In some places the Bentley is referred to as being the R9. Very few racing cars have a racing pedigree comparable to the R8. However, as successful as the R8 was, during the 2005 season, it was evident that its time at the front of the pack was drawing to a close. 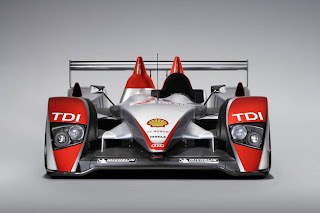 Audi had made the development of the Audi R10 TDI diesel public, and cars from other manufacturers and teams started to catch up in terms of on-the-track speed. The ACO still felt that the R8 needed to be kept in check, therefore they reduced the restrictor size on the R8's engine, due to the car not meeting new hybrid regulations, and stipulated the car shall carry ballast weight in an attempt to make the races more competitive. The R8 was restricted even further to only 520 bhp. 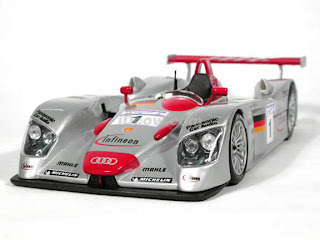 At the 2005 Le Mans, the Audis failed to qualify on pole position; the fastest R8 started the race in third position. However, as a hallmark to the R8's legendary reliability, the car was able to outlast all other competitors to take its fifth checkered flag at the venerable Circuit de la Sarthe and the 24 Hours of Le Mans. This victory was also notable since it was Tom Kristensen's 6th straight 24 Hours of Le Mans victory, and a record 7th overall, beating legendary driver Jacky Ickx's previous record of 6 career 24 Hours of Le Mans victories. To date the R8 remains one of the fastest petrol powered LMPs, setting a 3:29 at Le Mans, which was beaten only by the Lola-Aston Martins. However, the R8's best finish was at 379 laps, which is more than the Lola-Aston Martin's best at 373 laps. Two 2005 Audi R8's are driven by Doug Smith and Travis Engen in the GTP-WSC Enduro class of the HSR championship. Throughout its six-year history, the R8 has proven to be one of the most dominant cars in history. Indeed, of all the races it had entered over a seven-year period, the R8 lost a mere sixteen races total. Here is a list of some of the achievements of the R8. * - Season partially run by the Audi R10 as well. Main articles: Audi R10 TDI. Emanuele Pirro, Frank Biela and Marco Werner made history by becoming the first drivers to win the Le Mans 24-hour race in a diesel-powered car. The Audi R10 TDI completed a record 380 laps of the La Sarthe circuit, with Pirro at the wheel for the finish. French trio Sébastien Loeb, Eric Helary and Franck Montagny took second in the Pescarolo Judd No 17, four laps adrift. Scotsman Allan McNish was third in the other Audi, which came in 13 laps down after suffering mechanical problems. The venerable R8 continued to campaign the American Le Mans Series through the first half of the 2006 season, and made its final US appearance on July 1, 2006 at Lime Rock Park, Connecticut, piloted by McNish and Capello. The R8 ended its career in style by winning the race, the 50th American Le Mans Series win for the Audi R8. The R10s participated in the rest of the ALMS season, beginning with the race at Miller Motorsports Park, Utah. The name Audi R8 also is used by the production road sports car Audi R8 which is based on the 2003 Audi Le Mans quattro concept car, not the R8 race car. Production started in 2007. Last updated on 26 April 2014 at 09:36.